Tha am Bìoball Gàidhlig a-nis ri fhaighinn mar leabhar-d.
'S e am foillseachar Akerbeltz a th' air a chur a-mach - ath-fhoillseachadh de Bhìoball an SSPCK bho 1902 agus leabhar nan Apocripha bho 1860. Tha iad air a' chainnt 's an litreachas ùrachadh gu ìre, 's air a chur ann an cruth didseatach. "Chan eil am Bìoball air a bhith ann an clò fad bhliadhnaichean," thuirt Micheal Bauer bho Akerbeltz. "Agus ged a tha daoine ag ràdh gu bheil cuid de dhaoine ag obair air eadar-theangachadh gu tur ùr, chan eil dad ri fhaighinn aig an ìre seo, agus bha daoine a' tighinn thugam bho àm gu àm agus a' faighneachd am bithinn deònach a chur an clò a-rithist," thuirt e.
Tha Mgr Bauer ag aideachadh gu bheil dreach nas ùire den Bhìoball ann, ach bha adhbhar aige a bhith a' taghadh an dreach bho 1902. Tha e cuideachd ag ràdh nach do rinn iad "GOCadh" air. "'S ann aig Comann Bìoball na h-Alba a tha cead air a' Bhìoball (ùr) sin, agus 's e am Bìoball a thagh mise am Bìoball as ùire a tha a-mach à còirichean," thuirt e.
"Cha do rinn sinn air ach deasachadh aotrom. "Rinn sinn ùrachadh air cuid de na faclan, agus cuid den litreachadh a tha fìor fìor fìor sheann-fhasanta. 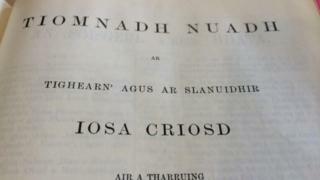 "Chan e sgoilear a' Bhìobaill a th' annamsa, agus bha mi airson urram a thoirt dhan leabhar, agus a bhith faiceallach. "Cha robh mi airson a nàdar atharrachadh idir," thuirt e.